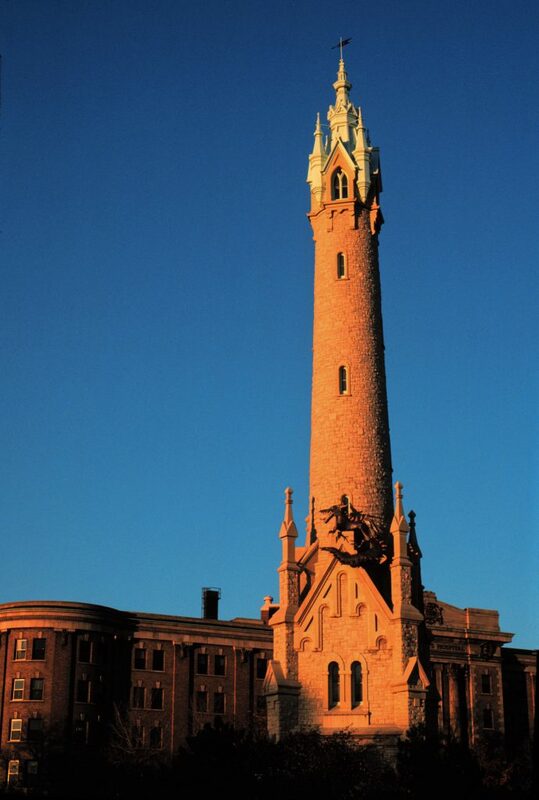 Opened in 1874, the North Point Water Tower encased a wrought iron standpipe to prevent ice from forming in the pipe. The standpipe relieved surges in water pressure from the North Point Pumping Station, which provided 16 million gallons of water daily to satisfy Milwaukee’s need for clean water. Charles A. Gombert designed the Victorian Gothic tower, which stands 175 feet tall. The standpipe pressure system closed in 1963 when a modern facility was built. 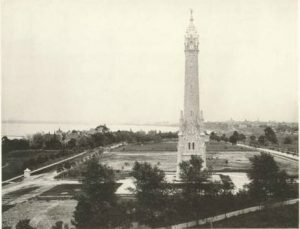 The tower was named a Milwaukee landmark in 1968, a national landmark of the American Water Works Association in 1969, and listed on the National Register of Historic Places in 1973. ^ Elmer Becker, A Century of Milwaukee Water: An Historical Account of the Origin and Development of the Milwaukee Water Work (Milwaukee, 1974), 58-59. ^ Gregory Filardo, ed., Old Milwaukee: A Historic Tour (New York, NY: The Vestal Press, Ltd, 1988), 10; Becker, A Century of Milwaukee Water, 58. ^ Filardo, Old Milwaukee, 10. ^ Becker, A Century of Milwaukee Water, 59. ^ City of Milwaukee, “Historic Designation Study Report: North Point Water Tower,” Milwaukee WI: Historic Preservation Commission, 1982, 2, Accessed September 18, 2013. Becker, Elmer. A Century of Milwaukee Water: An Historical Account of the Origin and Development of the Milwaukee Water Work. Milwaukee, WI, 1974. Becker, Elmer, and Jim Meyer. “North Point Tower.” Milwaukee Water Works. Milwaukee, WI, 2005. Filardo, Gregory, ed. Old Milwaukee: A Historic Tour. New York, NY: The Vestal Press, 1988. The Historical Marker Database. “Old North Point Water Tower.” Accessed September 18, 2013. City of Milwaukee. “Historic Designation Study Report: North Point Water Tower.” Milwaukee WI: Historic Preservation Commission, 1982.